One of the perils of covering a live event from the air is that, even in this modern age of instant communication, news organizations don’t always know what they’re looking at. 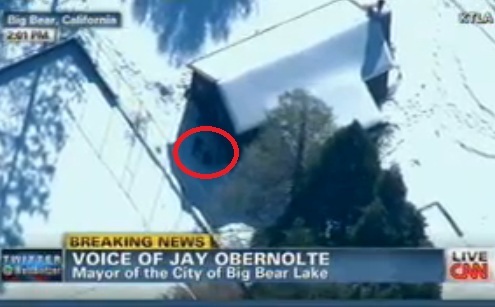 On CNN this afternoon, as anchor Wolf Blitzer told viewers that alleged multiple murderer Christopher Dorner was “now believed to be pinned down in this area,” and set about interviewing Big Bear Mayor Jay Obernolte, the helicopter shot from KTLA showed two police officers mere feet from the cabin that would turn out to be Dorner’s hideout. As Blitzer continued to interview Mayor Olbernolte, KTLA’s chopper-cam went black, then switched to another shot. It would be another ten minutes or so before the network would be told that the cabin was, in fact, Dorner’s location, and that law enforcement had requested that the media not broadcast live video of the scene. The owner of the cabin, however, later told police that the dwelling had no internet or cable, so it’s unlikely the shot would have compromised officers in any case.